Cash traded fed cattle were higher this week. The five-area fed steer price for the week of May 5-May 12 averaged $132.63 for live sales, and $208.55 for dressed; respectively, up $14.60 and $18.57. Total volume sold was unchanged from a week ago and up 21,000 head from last year. 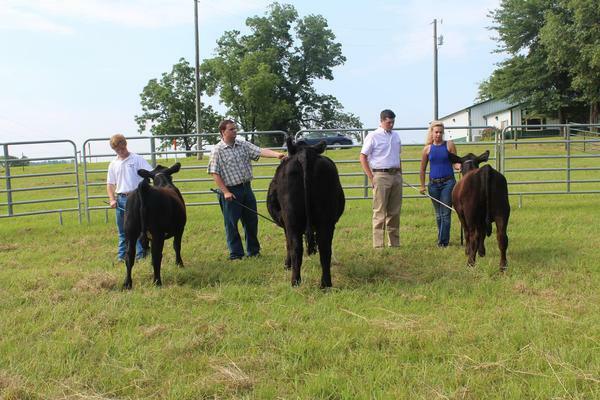 Feeder steer cattle and calves were mixed across the U.S. this week. Oklahoma City feeder cattle were $5.00 higher for lightweights and $8.00 higher for heavier cattle. Mississippi pasture conditions are relatively good this spring with 71% rated good or excellent, unchanged from a week ago. In Mississippi auctions, lighter weight feeders weighing 450-500 pounds were $7.50 higher from a week ago, averaging $167.50, while heavy steers were averaging $127.50, unchanged from last week. Live cattle futures and feeder futures were mixed this week. June live cattle were up $2.68 on the week and $28.98 lower than a year ago at $123.55, while August live cattle were up $0.80 from last week and down $32.03 from a year ago. Feeder cattle were mixed this week with May futures up $0.15 from last Friday and down $71.15 from a year ago at $147.85 while August futures are down $0.07 on the week. Nearby corn futures are up $0.13 from a week ago at $3.90 while September futures are up $0.14. 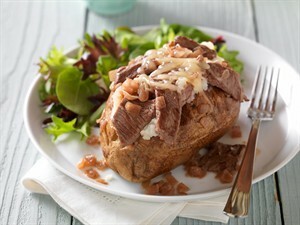 Wholesale boxed beef prices are higher compared to a week ago. Choice boxes averaged $213.00, up $7.28 from a week ago and $49.07 lower than a year ago. Select boxes ended the week with an average of $201.72, up $5.23 from last week. The choice-select spread widened from $9.23 a week ago to $11.28 this week. 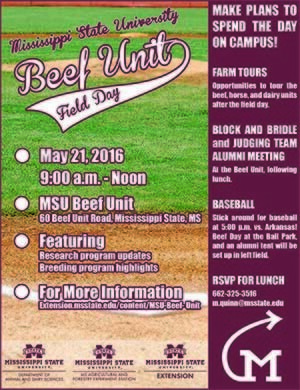 Also, that day is BEEF Day at the Ball Park during the MSU baseball game sponsored by Mississippi Beef Council. Don't forget the MSU Block and Bridle/Judging Team Alumni meeting after lunch at the Beef Unit. Make your plans to attend! 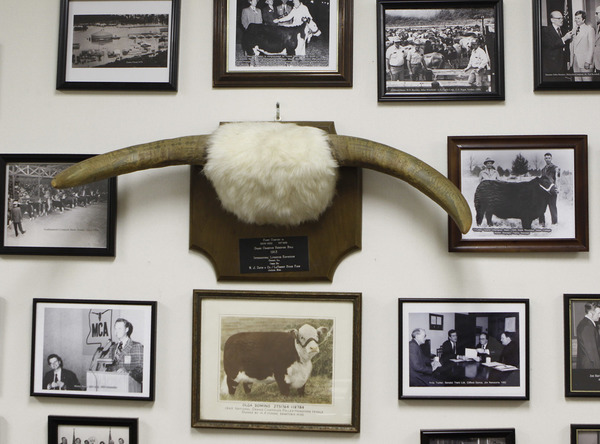 MCA has been blessed to receive items from cattlemen over the years to add to our collection that highlights the history of the cattle industry in Mississippi. One such item on display is the horns from the 1913 Grand Champion Hereford Bull at the International Livestock Expo in Chicago. This unique item was donated by the Fred "Hoss" Shaw Family. 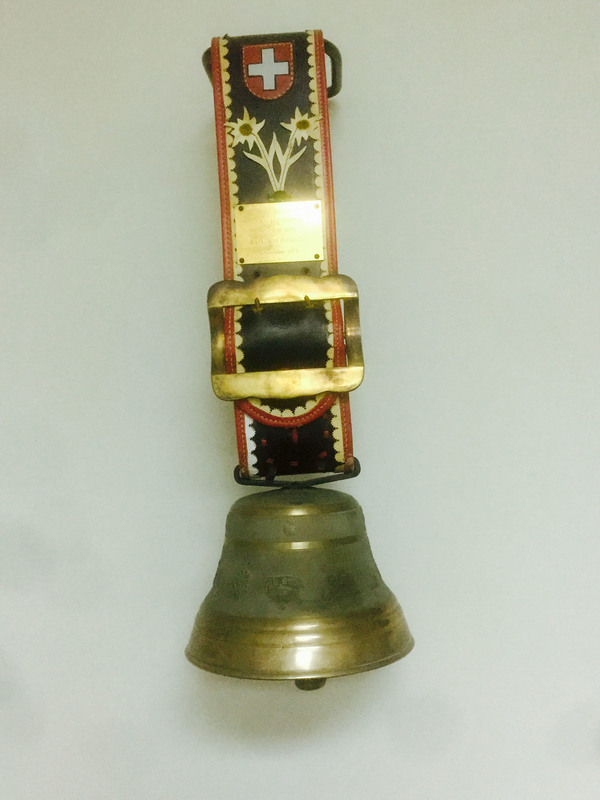 Pictured below is a commemorative bell presented to Micky Black, past MCA president, for registering the 100,000th animal into the ASA Herd Book. These and many other items can be seen on display at the MCA office. On Saturday morning MBC staffer, Nancy Strickland was in Hernando for the weekly farmers market helping promote Mississippi raised BEEF. Information was given out on nutrition, beef safety, as well as recipes. The United States Department of Agriculture’s World Supply and Demand Estimates were released on Tuesday morning (May 10, 2016). Beef production for 2015 was unchanged from last month’s estimate at 23.69 billion pounds. 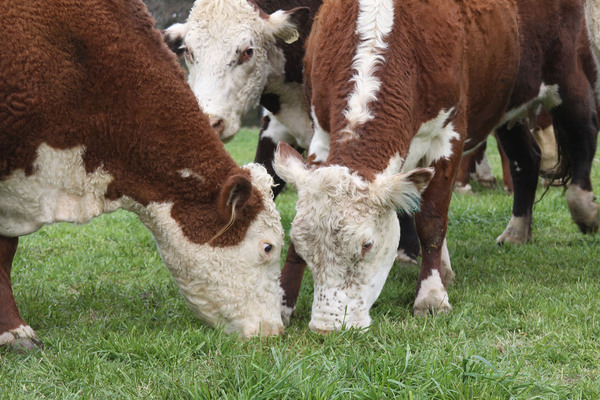 Looking ahead to 2016, beef production is expected to be up 1.112 billion pounds from last year at 24.81 billion pounds. The first projection for 2017 beef production was also released. An estimated 25.79 billion pounds of beef are expected to be produced in 2017. Per capita consumption for 2016 was lowered by 0.3 pounds per person to 54.7 pounds per person. On the crop balance sheet, corn ending stocks for the 2015/16 crop were estimated to be 1.803 billion bushels, down 59 million bushels from last month’s estimate. The first estimates for the 2016/17 crop year were also released and 2016/17 ending stocks are expected to be 350 million bushels higher than the 2015/16 stocks at an estimated 2,153 million bushels. 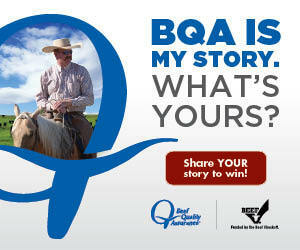 Look for MBC's BEEF billboards in South Mississippi during the summer months. Billboards will be in Laurel, Wiggins, and Hattiesburg promoting BEEF. The digital billboards will feature several BEEF messages throughout the summer, everything from salads to steaks. 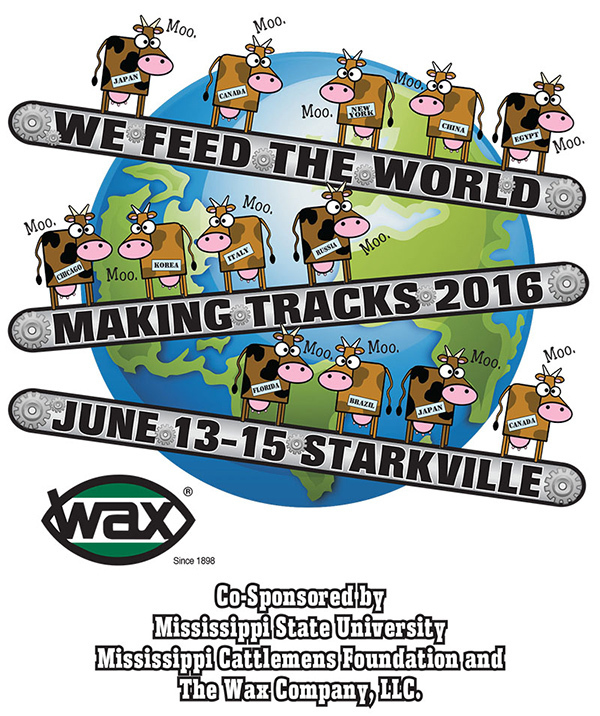 Click here for the Making Tracks application. Deadline is fast approaching so get your applications in! On Thursday, May 19 there will be an Alfalfa Hay Production and Equipment Field Day at the Costal Plain Branch Experiment Station in Newton. Topics will include: Establishment, Pests and Diseases, Inter-seeding, Harvest Management, and a Baleage Demonstration. To register contact Jenna Mosley at (601) 683-2084.